New Stonehenge exhibition shows relations of ancient Britain and Europe. Our ancient British ancestors have been “making and breaking relationships with continental Europe” for thousands of years, a new exhibition will show. Organisers say it highlights how there were different periods of connection with, and relative isolation from, Europe in Britain’s history. 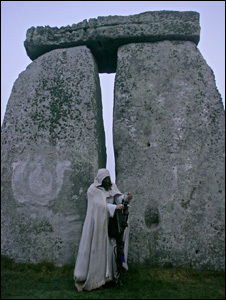 Experts say in the late Neolithic period when Stonehenge was built, about 5,000 years ago, communities living in the British Isles appear to have been insular and had little communication with continental Europe. But both before and after, in the early Neolithic and the early Bronze Age period, items, styles and religious beliefs were being shared widely. English Heritage historian, Susan Greaney, said: “From insular communities with what appears to be little outside communication, to mass migrations and the sharing of raw materials and finished artefacts, our ancestors have been making and breaking relationships with Continental Europe for thousands of years.